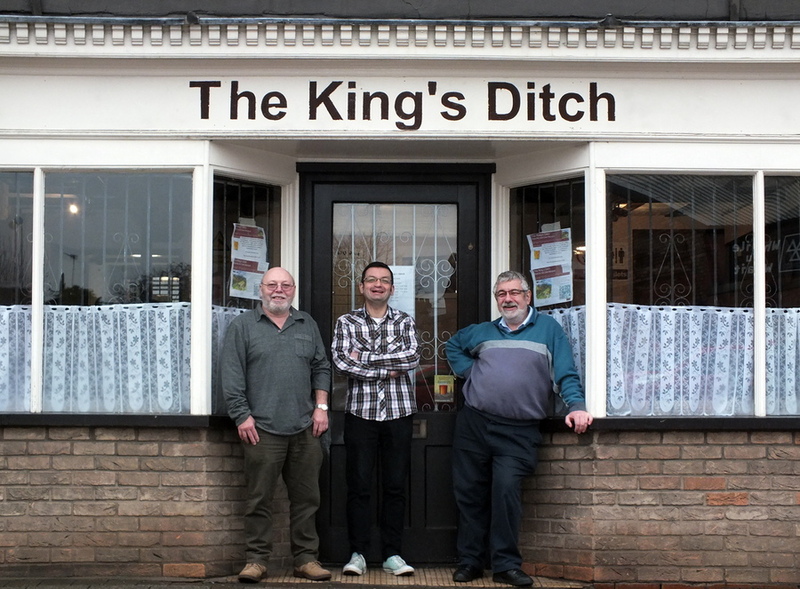 Specialising mostly in local ales, The King’s Ditch is Tamworth’s first and only micropub. Four to Six gravity-served ales straight from the cask are complemented by Twenty Five real ciders, Six Fruit Ciders and Three Perries, all carefully chosen by our passionate team. 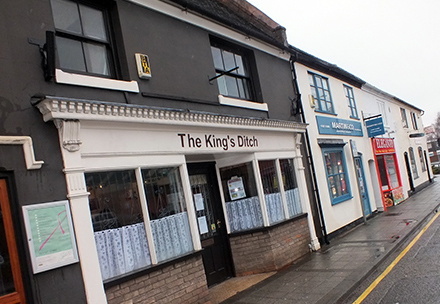 The King’s Ditch is characterised by its simple but modern bare brick and wood interior. 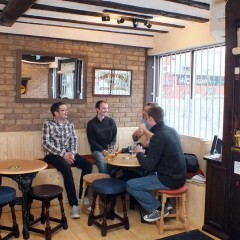 We have a single ground floor room and a small drinking area upstairs, accomodating around 40 people. The Beer and Cider being served from a chilled room at approx. 12 degrees centigrade. 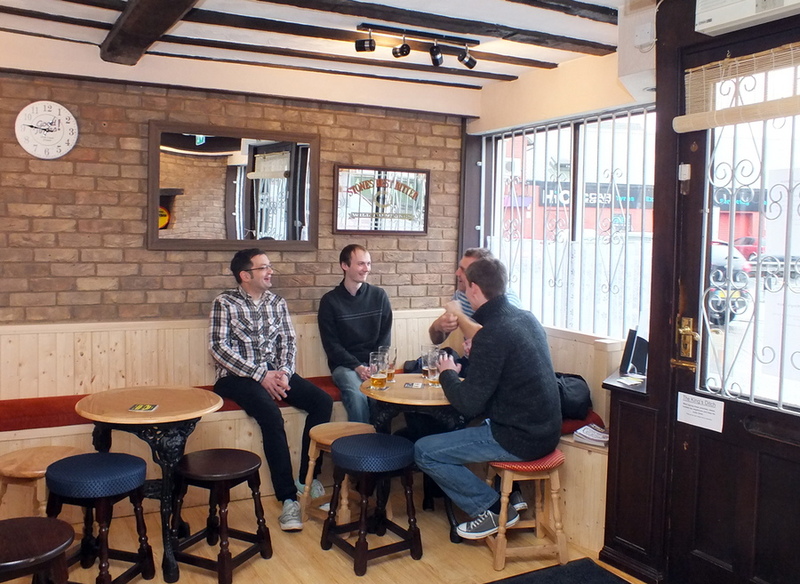 We don’t have any fruit machines, TVs or music – we simply have a warm and friendly atmosphere where people can enjoy real ale and good conversation. Please note! Children are welcome, to sit and not race around, until 7pm. Dogs are also welcome as long as they bring their owners. Please note new times from 4th January 2019. Beautifully balanced European and American pale ale with lemon and fruit flavours. Pale ale brewed with Apollo hops from the USA. Light, pale, hoppy session Citra ale. Simcoe and Citra hopped pale ale. Clean and crisp with soft peachy vibes. Take home your favourite Beer or Cider. One use cardboard container. Take home your favourite Beer or Cider. In this handy re-usable pouch. Take home your favourite Beer or Cider. In this handy re-usable carry keg. Made from hard durable PVC. Packed with loads of Centennial, Amarillo, Columbus, Cascade and Simcoe hops, dry hopped to the brink and back and sitting at 45 IBUS, Nanny State is a force to be reckoned with. With a backbone of 8 different speciality malts, Nanny State will tantalise your taste buds and leave you yearning for more. 330ml. 3 x Wold Top bottled beers of your choice in a box. 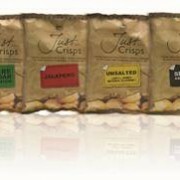 Gluten free varieties available. Take-out only. Against the Grain ( Gluten Free ) - Wold Top, Driffield, Yorkshire. Made from lager malt and Maize,is a premium full flavoured bitter beer with a good creamy head, refreshing bitterness and citrus aftertaste. The gluten content is well below the required CODEX standard of 20ppm. The ultimate catch, a refreshing golden pale ale with a fruity bitterness and lingering aftertaste. Certainly a beer to help create those “one that got away” stories! Brewed with home grown malts and hopped with the fruity Cascade and Goldings hops. If you’re a successful Angler this beer is a must for your tackle bag. Fish and Chips – perfect! A Czech style Pilsner. Straw yellow lager (that means lagered or matured for 4 weeks) hopped with Czech grown Saaz or Zatec noble hops with a distinctive hop aroma and bitterness usually found in Bohemian pilsners. Brewed with the finest English lager malt and fermented with a lager yeast and then cold conditioned for 4 weeks. Pilsners are traditionally quite bitter and this version is no different. Not for lager louts – its got too much flavour. It’s nothing like the Eurofizz brewed in chemical factories in the UK. This double Stout is brewed with pale malt, chocolate malt and roasted barley, in the copper the finest Kent Hops and a late hop with Kent Golding's. The beer has a chocolate malt and coffee nose with flavours of rich dark fruit. A red beer to halt you in your tracks, giving you a warm red glow! A mellow malty flavour, from Wold grown barley, dark crystal malt and roasted barley. Hopped with Progress hops. The best beer to use for ‘beef in beer’. Scarborough Fair IPA ( Gluten Free ) -Wold Top, Yorkshire. Strong and well hopped, interestingly brewed with a Pale predominately Wold grown malt base, a triple hop blend and Maize for the head retention. This IPA is also certified Gluten Free, with a gluten content that is below the CODEX standard of 20ppm. Scotney Pale Ale ( Gluten Free ) - Westerham Brewery. Golden,Amber beer brewed with the finest Kent Hops. The Hops are combined with English malted barley and greensand aquifer water and fermented with Westerham Brewery's own heritage yeast culture to produce a crisp hoppy pale ale. Wold Top Bitter is a light amber coloured, crisp clean aromatic session bitter. Home grown Barley malt and Northdown hops give an unusually full flavour and a long hoppy finish for its abv. Wold Top Bitter makes excellent beer batter for the chefs amongst you! Kingston Black - Gwatkin Cider, Abbeydore, Herefordshire. The Kingston Black apple is the most famous apple in the cider making world. Dating back many centuries. A favorite with the old farming communities and the traditional way of making cider, often kept for the vintage house cider and drunk on special occasions. An unclear dark orange cider. The aroma is sweet and like over ripe fermenting apples. The flavour is sweet with nose of apple core and yeast leading to a dry finish. 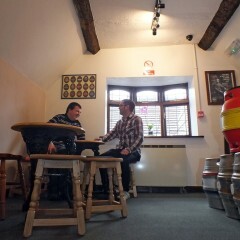 Harry's Haystack - Harry's Cider, Langport, Somerset. A lovely appley aroma, using a blend of apples from Harry's orchard including the classic Dabinett variety. A deep amber, clear, medium dry cider. Sheppy's Farmouse - Sheppy's Cider, Taunton, Somerset. This traditional dry cider is completely unsweetened. Clear and golden are the only way to describe this "scrumpy" cider. Janets Jungle Juice - Westcroft, Highbridge, Somerset. A medium dry, clean, fresh, fruity cider with a golden haze. Full bodied and exquisitely quaffable. Won many CAMRA awards. Surprisingly very clear and golden for a Somerset cider, but has a beautiful apple smell. It starts rather crisp and smooth to begin with, but then the acidity and dryness go into overdrive, and take your mouth on a spectacular journey! Not for the faint hearted, very strong. Devil's Device - Mr Whiteheads, Sherborne, Hampshire. Quite clear and golden in colour with a full bodied smell. Nutty, earthy flavours are dominant in this cider, rich with a good deep body it is medium with a dry aftertaste. Made from 100% Kentish Apple Juice. Eight different varieties of apple are blended to make a light and flavoursome cider. Clear refreshing Medium cider made with Worcestershire apples. Fruity apple aroma, well balanced. A light and very easy to drink medium cider. Apple & Blackberry - Lilley's Somerset. A still medium cider made with blackberry juice. Smooth, Sophisticated Mango cider made with an ample fusion of exotic Mango fruit and somerset apples. To give a mouth watering tropical flavour. Stoke Red bittersweet variety of cider apple, sharp sweet scrumpy cider. Passion Fruit & Apple, Kiwi & Lime, Summerberries. Lemon & Ginger Cider - Lilleys Somerset. Medium Dry, expertly blended to bring out the zing of the Lemon & Ginger. Medium Dry Cider matured in oak barrels to produce a cider. Rich in colour, body and flavour, with a fresh fruity aroma. Medium Perry, fruity, Amber slight hint of red, clear cider. Bootleg Moonshine - Original Cider Company, Ledbury, Herefordshire. Extra Strength cider, clear coloured strong in Alcohol and fruity with an apple flavour, sweet on the palate. Some fruit and whiskey flavours with a hint of dryness. A huge quality prosecco in 200ml bottles. Light straw in colour, Woolloomooloo Chardonnay displays an enticing nose of peach, citrus and lemon aromas. The tropical fruit flavours and luscious mouth feel mid-palate compliment each other to deliver a deliciously rounded wine with a crisp and clean finish balanced nicely by gentle acidity. Pale Lemon in colour, this exclusive Chilean wine combines aromas of fresh grapefruit and Lime, followed by flavours of Green Gooseberry and ripe melon on the palate. Vibrant Pink in Colour, this delicious Zinfandel-Rose has aromas of fresh watermelon and juicy cherry. The palate is full of strawberry and cream flavours, perfectly balanced with a fresh and lingering finish. Opaque and ruby red in colour, Woolloomooloo Shiraz displays a nose of smoky, ripe berry fruits with a touch of mint. Smooth and rich on the palate with spicy flavours of luscious dark berry fruits, the balanced tannins help to deliver a tremendously concentrated finish. Cherry gin? Now that’s not something you see every day! Made in the finest sloe gin tradition, both sweet and sour Marasca cherries are used to create this rich nectar. Works well with everything, including cola! Fragrances of Christmas cake, sugared almonds and cherry ice cream. A refreshing hint of orange oil. Buttery almond biscuits. Like a cross between a cherry brandy and a sloe gin - a total marvel. Served with Fever-tree light tonic or coca cola, or a mixer of your choice. A Mediterranean gin infused with strawberries! This is a variation from Larios. A fruity gin with plenty of strawberry notes supported by citrus and soft juniper. A striking pink version of Larios Mediterranean gin that has an intense strawberry aroma and is full of soft, delicious fresh strawberry flavours. Served with Fever-tree Mediterranean tonic, or a mixer of your choice. The Warner Edwards friends have gone all regal and created Victoria’s Rhubarb Gin, which uses a variety of rhubarb originally grown in Queen Victoria’s garden, hence the name. They also add just enough sugar to balance out the acidity from the rhubarb, producing a spirit with plenty of sweetness and some subtle, enjoyably sour notes emanate from the rhubarb. Served with Fever-tree Ginger Ale or a mixer of your choice. Fifth Spire Gin is a premium spirit made in Lichfield. The gin is constructed in two parts. The first is loaded with juniper berries, coriander seeds, cassia bark, angelica, orris and liquorice roots, pink peppercorns, almonds, and orange peel. The other is only used for fresh citrus fruits. The result is a luxuriously smooth spirit with a classic gin taste riding on a big wave of fresh citrus. Served with Fever-tree light tonic or a mixer of your choice. While the original Whitley Neill Gin is inspired by the exotic flavours of Africa, their Rhubarb & Ginger Gin variation takes inspiration from closer to the Whitley family’s homestead. Subtly tart with clear rhubarb influence. A twist of orange sweetness and herbaceous coriander brings balance to the palate. Served with Fever-tree Ginger Ale or a mixer of your choice. The genuine article in cans. Coffees from the Tassimo Range. Normal English Tea. Cadbury's Hot Chocolate from Tassimo Range. Quality sausage roll. served with mustard or apple chutney if required. Classic Pork Pie, served with mustard if required. Sea Salt, Sea Salt & Black Pepper, Sea Salt & Apple Balsamic Vinegar, Mature Cheddar & Red Onion, Jalapeno. * Please note all drinks and menu items are subject to availability and may change at short notice. Food will be limited to a small selection of local produce. 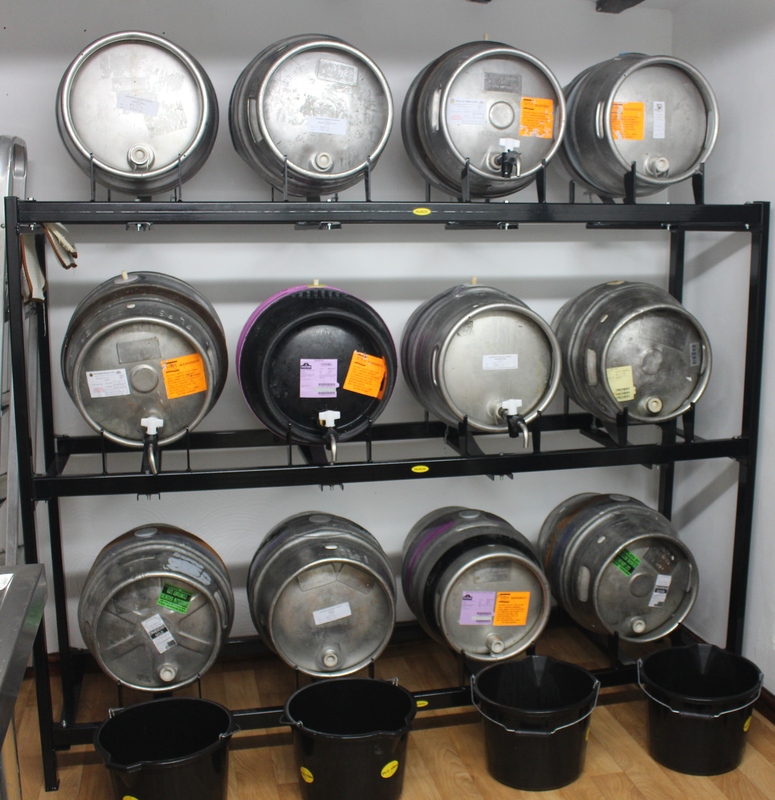 But we are a micropub, so by the time we have filled our stockroom with all of our ales and ciders, we haven’t any room for food preparation! We are happy to invite you to bring your own food and enjoy it in our pub. Bring your sandwiches, and we will provide the plates and cutlery if you want them. Just so long as you buy our drinks – we are happy!!! 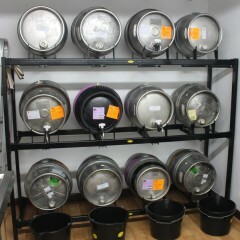 Excellent quality ales. Run by people who have the time of day to converse with you. Will definitely return. Nice to be able to enjoy a atmosphere with no music, just good conversation. A art sadly lost in our modern lifestyle. 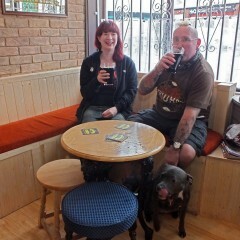 Brilliant micropub with nice, friendly atmosphere! Great venture - I wish it every success. Staff very friendly. Atmosphere good. Most importantly the ale is top class. 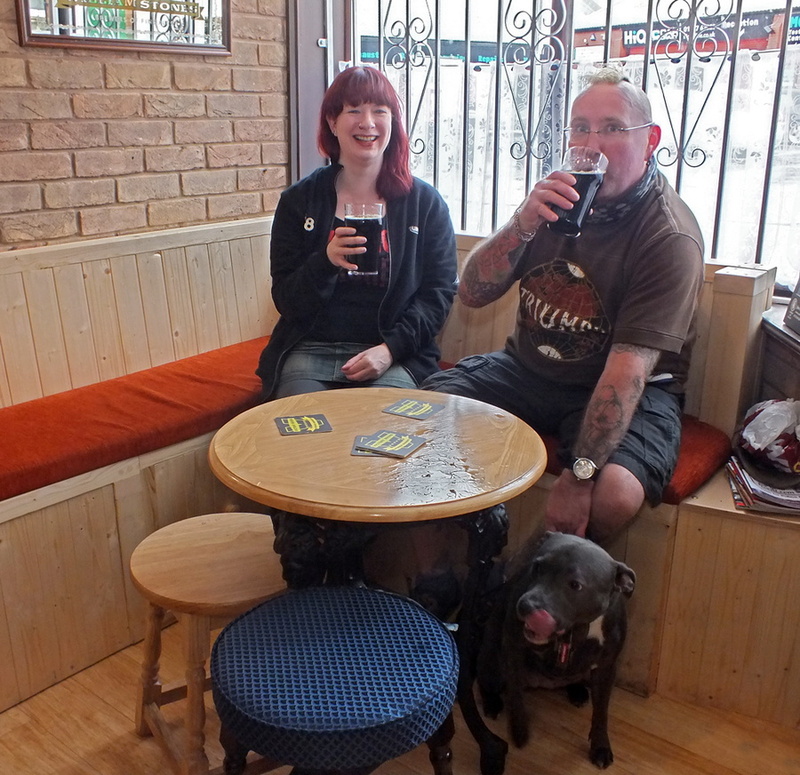 Micropubs are springing up all over the UK. 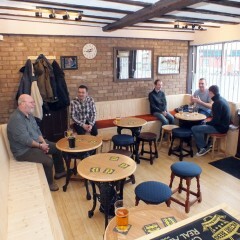 A Micropub is a small freehouse which listens to its customers, mainly serves cask ales, cider, wines and no draught lagers, promotes conversation, shuns all forms of electronic entertainment and dabbles in traditional pub snacks. For more information see micropubassociation.co.uk. 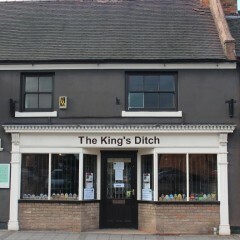 So why The King’s Ditch? 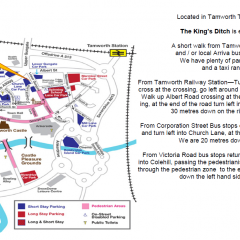 Well it goes back to the very origins of the name Tamworth, they add the worth bit in the name, meaning enclosure, Tamworth = enclosure by the River Tame. The enclosure in this case consisted of a broad ditch and bank, known variably as the King´s Ditch or Offa´s Dyke or Walferlong. 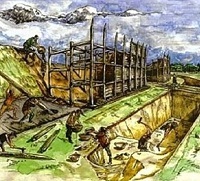 Similar Saxon earthworks and fortifications have been measured at upto 50 ft wide. The King’s Ditch was still visible and cleared identified on maps in the 19th Century. By 1884 the eastern ditch had disappeared. Alignment of Ditch shown as dotted line. The Northern line has been placed at approximately between 51 Lower Gungate and Bell Corner. 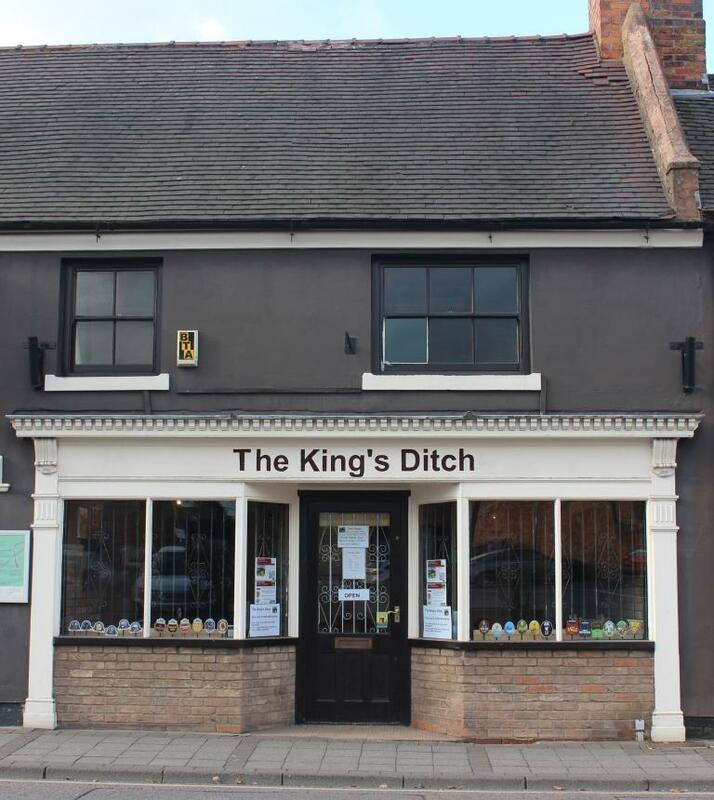 From the various historical reports we have found the Ditch may date to either King Aethelfaed’s or King Offa’s rule — that’s over a thousand years ago and well before the castle or church were built. 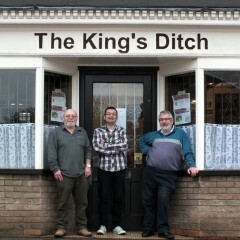 The King’s Ditch was setup by Dave Barnfield, Ade Smith and Ged Fisher. Formerly a cycle shop, after renovation we opened for business on 27th November 2014. 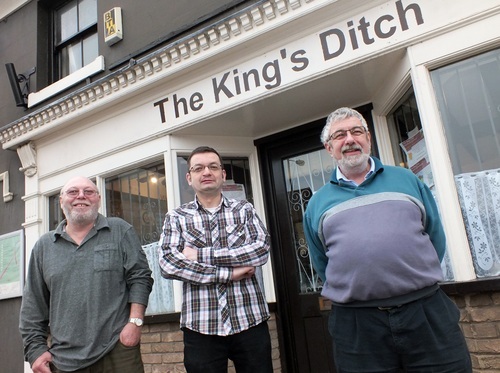 It was Ged’s dream from Christmas 2013 to open a micropub, having been to several in Kent, that September. 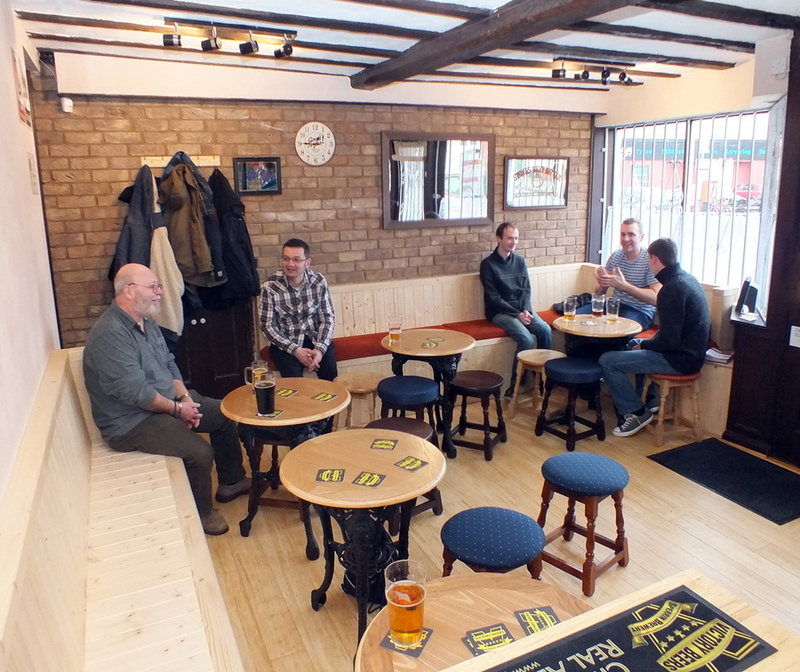 The premises were found in June 14 and lease signed in October, it took 5 weeks to lay the floor, get the stillage, build the benches (with thanks to John Deeming), source tables and chairs, install the cooling system. Oh and get the Beers and Ciders. 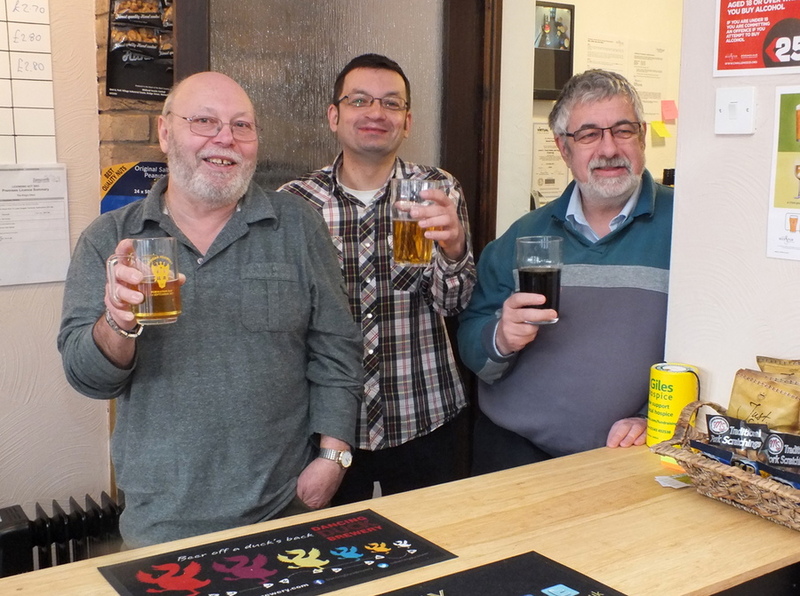 We have a passion for real ale and cider, having been keen followers of the local football team, and Camra members, we have been in many pubs on away days and drunk many pints of good and not so good beers. 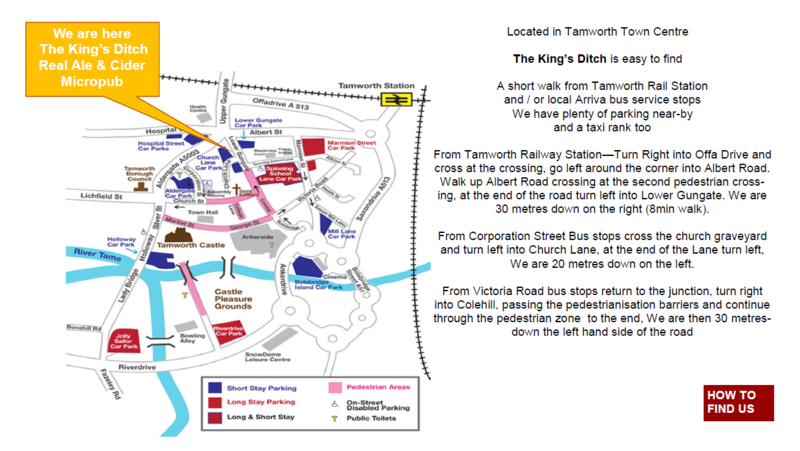 We thought that we might be able to supplement the beers sold by other establishments in Tamworth. 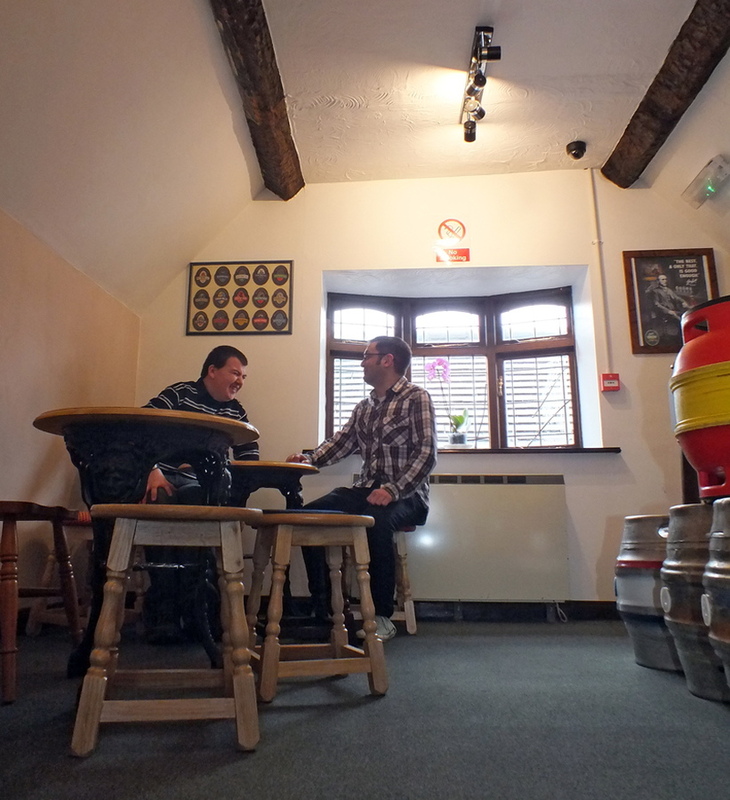 Our aim is to complement the two or three other pubs that sell real ales in the town by using different breweries and beers to the other pubs, the main aim is LocALE from small micropubs that produce a good standard of ales. 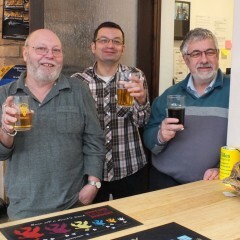 Dave decided early in 2015 that working behind the bar wasn’t for him, so he left the company, so Ade orders the beers, and Ged looks after the cider and other items. We jointly run the pub. 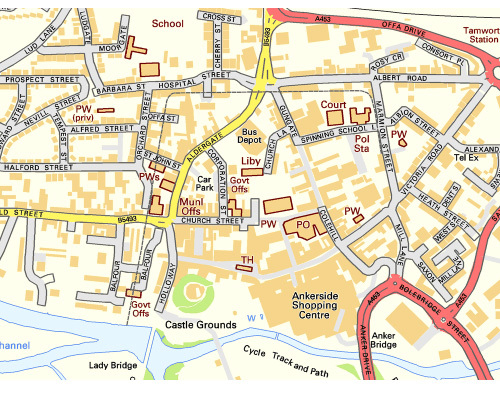 We’re just an 8 minute walk from the railway station. Head to the island from the station forecourt, follow the path to the right to the crossing, cross road and take the left path towards Domino’s Pizza, pass this building on your left and go up Albert Road. Pass the Albert Pub, until you come to the junction with the traffic lights. 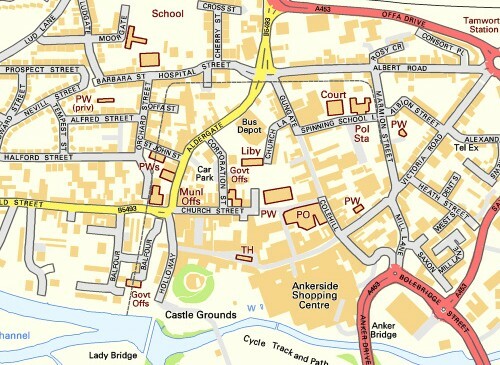 Turn left into Lower Gungate. We are 50 metres down on the right.